India pale ales and hop-heavy pale ales are the favorites of beer drinkers right now, but the tastes driving that appreciation are shifting. Pine or orange once led the way, but now hops are showcasing flavors of tropical fruit and even blueberry. Increasingly, varietals like Citra, Simcoe and Mosaic are lingering on the lips of beer lovers, just like the increasing number of beers they influence. Those three, along with others like El Dorado, have all seen significant jumps in production, according to Hop Growers of America, which tracks the hop industry. In the last three years, the harvested acreage of each crop doubled in the U.S. Mosaic, quickly becoming one of the most popular aroma hops, went from 382 acres harvested in 2013 to 1,800 in 2015. “With these types of new varieties that behave very differently than others historically, the expectation and palate has shifted to really want to get full saturation with new flavor profiles,” says Jean-Claude Tetreault, co-founder and co-owner of Boston’s Trillium Brewing Co. He should know. Tetreault has gained a rabid following for hopped-up beers like Fort Point Pale Ale, which showcases Citra hops and also had a Mosaic dry-hopped variant, and Artaic, a 100 percent Mosaic double IPA. 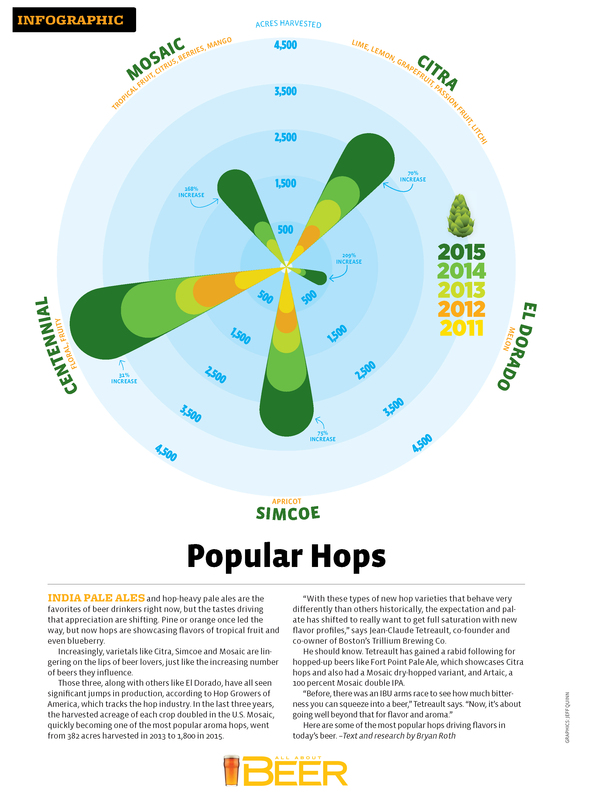 Here are some of the most popular hops driving flavors in today’s beers. Click the image below for an enlarged version, and check out additional beer-related infographics here. Pls deer God bring back the dank hop bombs.